For many years I knew only that Josef ZAJICEK and his wife Josefa KREMLOVA lived in Chicago and had immigrated from Bohemia. They had 6 children, Emily, Edward, Anna, Henrietta, Charlie and William. Edward was my husband's grandfather and his namesake. Josef worked as a tailor in downtown Chicago. Sometime during the 1890s the family moved to Danville, IL and at least one child was born there, but they returned to Chicago in the early 1900s. In their late teens and early 20s, Edward, Henrietta and Emily worked at Western Electric. On Saturday, July 24th, 1915, Western Electric was having it's 5th annual company picnic aboard the S.S. Eastland, known as the "speed queen of the Great Lakes". Over 7000 tickets had been purchased for this event. The S.S Eastland was part of a fleet of five excursion boats assigned to take Western Electric employees, their families and friends across Lake Michigan to Michigan City that day. 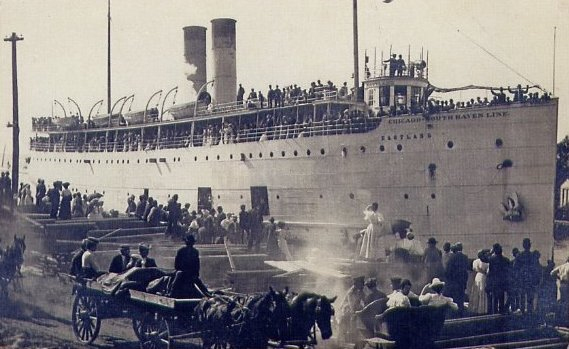 The last voyage for the S.S. Eastland and Henrietta Zajicek, July 24, 1915. Edward and Henrietta went on the trip that day, but according to Emily's granddaughter, Liz Whitlock, Emily did not want to go because she was shy and not very social. Once the passengers had boarded, and perhaps from all of them moving to one side to wave, the ship rolled into the river at the wharf's edge with over 2,500 passengers, including crew members, on board. Over 800 people lost their lives, including 22 entire families. Edward managed to escape but lost track of his sister, Henrietta. My father in law, who is Edward's son, says that Edward told him about helping to pull passengers out of portholes, looking for Henrietta, but not being able to find her. She died that day on the Eastland at age 18, and left Edward with memories that would haunt him for life. Edward was the first child to marry in 1920. His wife was Josephine Brecka. Oldest daughter Emily married Victor Vondrasek in about 1927. Anna remained single and seemed to be the family caretaker. It seems that in the late 1920s and early 1930s the family needed extra help. Son Charlie was diagnosed with schizophrenia and committed to Elgin State Mental Hospital in about 1930 where he remained until his death in 1943 at age 41. Sometime during that time he changed his name to Charles Cornell. Mom Josephine dies in 1932 following surgery, and rumor has it that youngest son William was disowned due to conflicts with his parents, and moves out while still a teenager. Anna becomes the caregiver for her father until his death in 1940. Anna then marries William Kraft, a man 8 years her junior, in 1944 at age 44. Until 2010 the only clue I had as to a hometown in Bohemia for Joseph or Josephine was on Josephine's death certificate that gave her birthplace as "Radinicich, Czechoslovakia". They apparently did a good job of keeping their history hidden. Edward was the informant for his father's death certifcate but he put "unknown" when it asked for name of Joseph's father or mother or birthplace. This seems incredible to me now that I know that Joseph's parents had immigrated and lived in Chicago. Edward's grandfather died when Edward was 1, and his grandmother when Edward was 6. So why didn't he know them at all?